If amusement parks aren’t your family’s thing, you can choose from two indoor waterparks. Kalahari has an African theme where you can get your picture taken with a baby tiger and other African animals. Great Wolf Lodge has a wilderness theme and was the first indoor waterpark in Ohio. In addition to their waterparks, both places have several restaurants, arcades, and family-oriented activities so you won’t need to leave the resort. 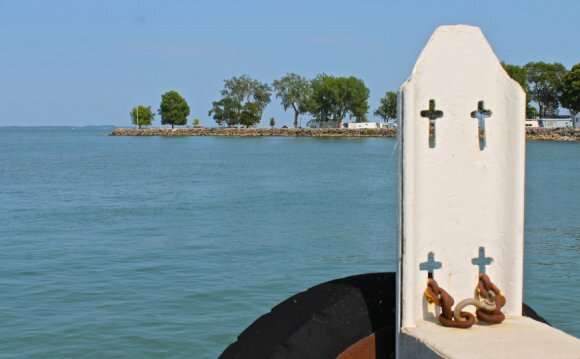 Downtown Sandusky offers a park with a playground, picnic shelter and great views of Lake Erie and the islands. Fishing is permitted with a license. You can ride an indoor merry-go-round and watch carvers work on a project at The Merry-Go-Round Museum in downtown Sandusky. After a busy day, make your way to the local dairy for ice cream! Toft’s Dairy and Ice Cream Parlor offers homemade delicious frozen treats and call ahead tours. Lagoon Deer Park is a petting zoo with animals from around the world. You can walk through the animals as you feed them. Kelleys Island is a small island where you can see the 20, 000 year old glacier grooves left in limestone by a giant ice sheet. South Bass Island (Put in Bay) is home to Perry’s Cave, a butterfly house, parks and miniature golf. You can take an elevator to the top of Perry’s Victory and International Peace Memorial (built to honor those who fought during the Battle of Lake Erie during the War of 1812) and see Michigan and Ontario, Canada. The islands can be accessed by ferry (you can take your car), private boat, or airplane. Bicycles and golf carts can be rented for traveling around each island, if needed. Visit the Birthplace of Thomas Edison in Milan, Ohio, about a 15 minute drive south of Sandusky, to see where Edison lived for his first seven years and see many of his inventions. Take a short walk to the Milan Museum Complex (7 buildings) and learn about the history of this historic town and see an antique doll collection and other toys of the time. Rutherford B. Hayes Presidential Center is in Fremont, a short drive from Sandusky. Hayes was governor of Ohio and the 19th U.S. president. On the grounds are the presidential library, museum, and family estate.